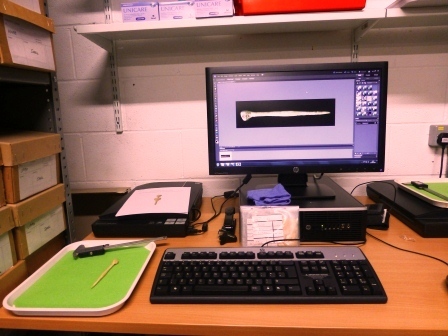 As part of the Museum of London’s Collections Online project, and with additional funding from Arts Council England, volunteers have been working on the digitisation and cataloguing of the Museum’s enormous collection of Roman bone hairpins. These are objects which are found throughout London, and throughout the Roman period in London, and reflect all social strata. Alongside their obvious primary function, holding up hair, they can provide us with insights into Roman fashions and grooming regimes, but also into wealth and social status, beliefs and superstitions, and, potentially, identity. This project includes the involvement of volunteers at the LAARC working on creating new records for each hairpin held at the archive, and creating a digital image to be uploaded to the Museum’s searchable public database. This will help researchers and other interested parties to locate examples of the pins found in London, together with a useable record. But first, paperwork. 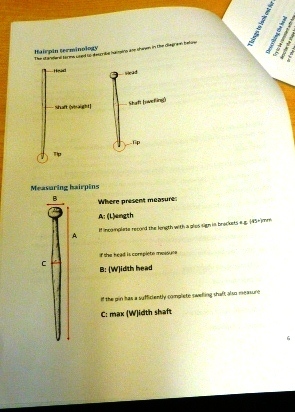 As a volunteer, I’ve been provided with this ‘All you ever wanted to know about Roman hairpins but were afraid to ask’ guide put together by MOLA’s find specialist, Michael Marshall. 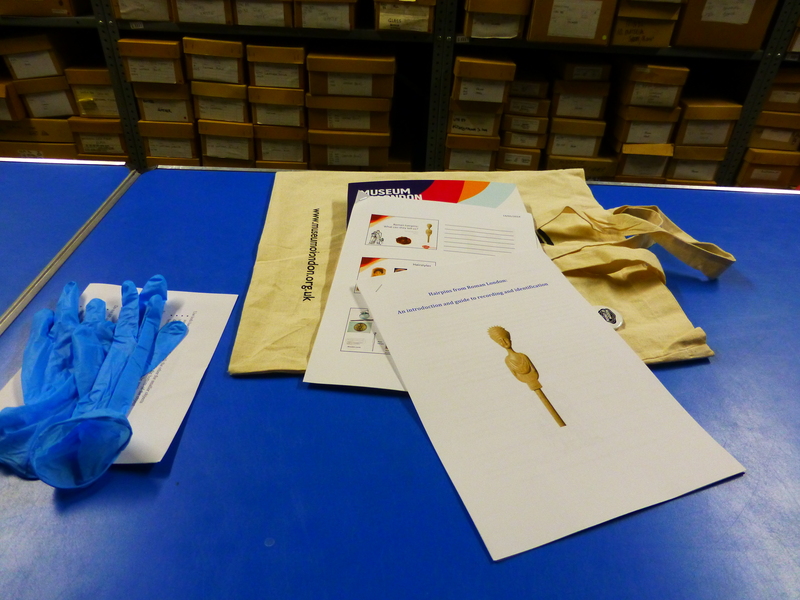 As well as more general background and information, this also gives us the correct terminology and the relevant typologies for the job, guidance on how to record the pins, including where and how to measure the pins, and some broad dating information. And here’s my kit and set up. It ain’t much but it’s home (for the next few weeks anyway). My first pin was not a thing of beauty. Never fear. I am not moved solely by mere outward appearance. It’s from Keston Roman Villa in Bromley and, frankly, it’s a lumpy old thing. We wondered out loud whether it was a home-made job, whittled out of the mortal remains of someone’s dinner but, in any case, it would certainly have been functional. 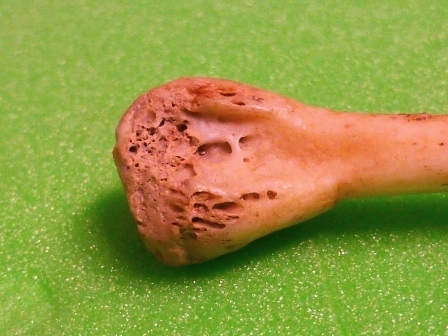 With this example, it’s easy to see what this pin is made of, as the structure of the animal bone is clearly visible. 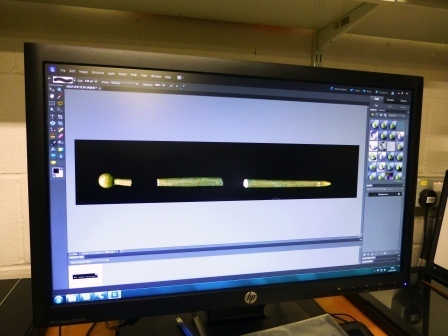 Basically, we create a record to be uploaded to the Museum’s database, measure the pin and create a digital scan of it, which we then clean up using photoshop. 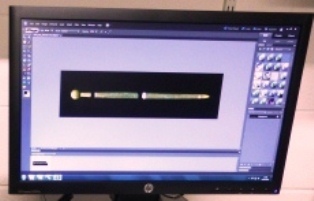 We don’t actually manipulate the image of the pin itself. We’re not working for a fashion magazine where every image can only show skinny, flawless, wrinkle-free perfection. We do things like clean up the background, straighten the image and ensure that we’ve got consistently proportioned images so that anyone viewing them can compare like for like. My next pin was slightly tricky, as it was in three pieces. The pieces all fitted together, so it was certainly all there, just not all together. 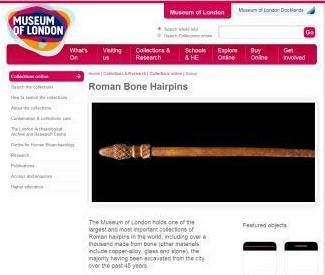 The Roman hairpins section of the Collections Online website is here: Roman Hairpins. You can see how the record turns out once all of this imaging work has been done, and I think that they look really good. This is not 3D scanning, but because of the way that this particular scanner directs the light source, we’re getting good modelling on the images and the pins look like real objects rather than dodgy photocopies. These have been just two of the archive’s collection of pins. I understand that there are thousands, ranging from the bog-standard, everyday, undecorated kind, to the highly ornate and clearly quite expensive ones. The current project is concentrating on pins made from animal bone, but they are also found made from jet or shale, and metals, including silver. Our current work is just a small step towards creating a full, and fully accessible, archive resource for future users. This entry was posted in Uncategorized, Volunteering and tagged Archaeology, LAARC, London, Museum of London, Roman, Roman hairpins, Volunteering. Bookmark the permalink. ← To the place where the yew trees grow*. Hi Guy, I didn’t realise that you were working on this project as well. That’s brilliant. If you’d like to contribute some photos/narrative to the blog posts about the project, I’d be happy to add them in (credited to you, of course). Glynn said that he would be happy for this project to be blogged. 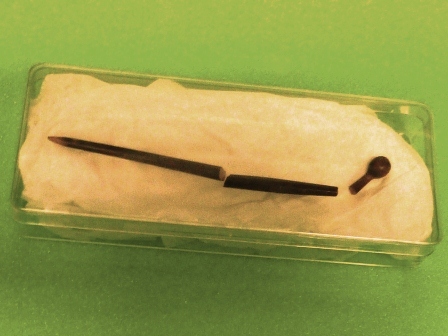 There are several uses for the word ‘bodkin’, both in UK and US English. 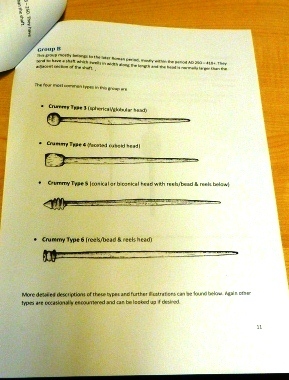 The types of’ ‘bodkin’ with which I am most familiar are tools used in sewing. There’s a sharp tool for making holes in leather, or a blunt needle used for threading elastic or ribbon through loops of a hem. The useage here refers directly to Janet Stephens’ useage, which is as the name of a type of long, single-shafted hairpin with a top. I’ve attached the link to her article, which is all about Roman hairdressing.